If you are a music head, live in the DC area and are of able body to come out, then there’s NO excuse for you to miss this awesome line up of Djs!!! 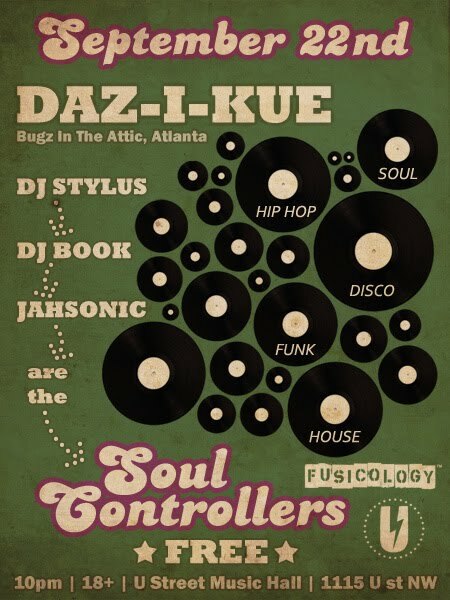 You have Washington DC’s own Worlds Flyest Soul Controllers ( DJ Stlylus, Jahsonic & DJ Book), AND Daz-I-Kue (Bugz in the Attic/Uprock) ….this is NOT TO BE MISSED!!! Oh, did i also mention that it’s FREE! that’s right so all ballers, budgeters and broke asses come out and dance!